1. Put together a time capsule. Spend some time getting creative about a collection of things that represent your years together. The silly knit cap you were gifted, a treasured pet toy, the Cracker Jack prize you’ve kept all this time, that concert T-shirt – nothing’s off limits! You can go traditional and bury your treasures in a waterproof container to be dug up in the agreed upon number of years. Or wrap up your package and add a gift tag designating when it’s to be opened – put it in the attic or other location where it won’t be underfoot, but it also won’t be forgotten. This could turn into an annual tradition – every year you could dig up/unwrap your capsule and add a new treasure or two to represent your ongoing marital journey. 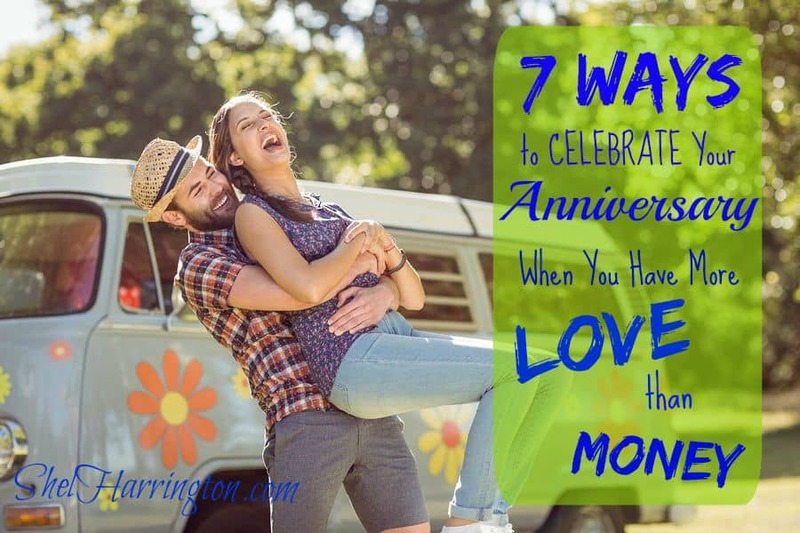 BONUS: You have already created a future low-cost anniversary celebration. 2. Have a celebratory breakfast. A Belgian Waffle splurge will still come in substantially under what a dinner out would cost. BONUS: It’s a great way to start out your special day! 3. Go retro. Activities from your youth such as bowling, indoor ice skating, roller skating, or visiting a video arcade are easy on the wallet and great for generating memories. BONUS: Any sore muscles developed as a result of your blast-from-the-past activity could lead to an anniversary-extending massage! 4. Try out that upscale restaurant. But skip the dinner! Get yourselves dressed up and enjoy a leisurely-paced appetizer or two followed up with a grand-finale dessert! BONUS: You get to test-drive the wares and make an informed decision as to whether or not you’d even want to invest in a main course for a future splurge. 5. Head to the zoo. Now when was the last time you did that? There’s probably new features and animals that you’ve never even heard of. BONUS: the goofy selfies with the giraffe towering behind or the expressive photo-bombing monkey included are great Facebook fodder as well as souvenirs. 6. Rent THAT movie. You know – the one you saw at the theater when you were dating? This time you’ll be able to hold hands without worrying about if your palms are getting sweaty! BONUS: If sparks start to fly, you don’t have to mess with that romance-delaying drive home! 7. Write a love letter to your spouse. Whether it is your gift to your mate, or you each write one to trade, writing a a love letter to your spouse is a true treasure. BONUS: It is a portable, irreplaceable gift that has the power to keep on giving! Even when you have a lot of money, the love is more important every day and for celebrations. Good point, Marylin – let’s hope we all always have more love than money!! Great list, Shel! The time together, where no money is spent, is always the best. And it creates some of the fondest memories! Am I back in your feed yet, Jill? Time well spent, I would say. Great ideas! Thanks, Noreen! I’m contemplating the time capsule myself! good ideas to keep the romance alive! Thanks, Lin – good to see you! Giving each other cards is one thing I like. Keeping the card and reading them once in a while through the years is a fun thing to do, too. Totally agree ZL – cards are a gift that keep on giving! It all sounds good, but you really had me with the ice cream stops!